I’ve tried plenty of digital painting and sketching apps over the last few years, with Autodesk’s Sketchbook, Wacom’s Bamboo and Inspire Pro by SnowCanoe all having spent time on my tablet or phone, but Procreate really stands out from the crowd. I’ve been using Procreate with the Wacom Creative Stylus for about six months and it continues to impress with version 3.1 which adds pressure curve adjustments for styluses, significant improvements to brush presets and capacity for larger canvas sizes, ready for the iPad Pro. or Corel Painter , this is somewhat disappointing, but after a few hours of practice, this ‘basic’ UI is actually an ingenious minimalism. 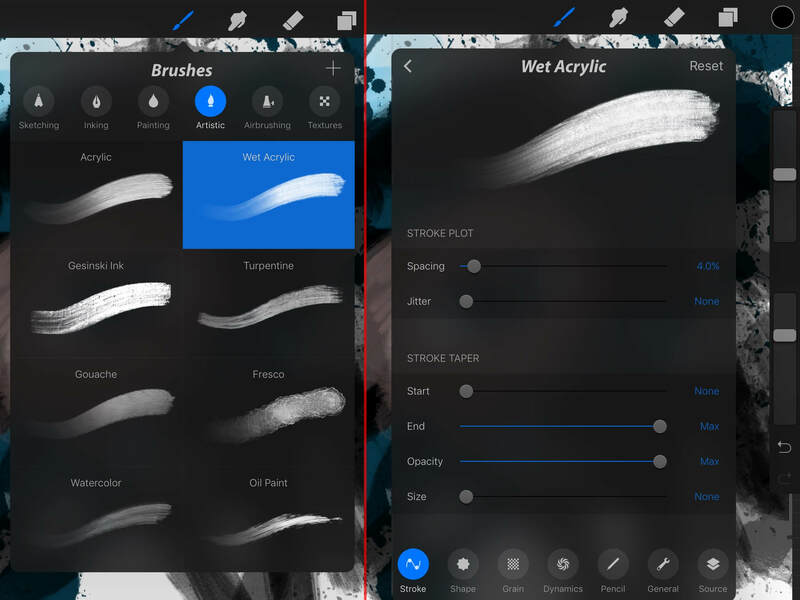 Each of the main tools (brush, smudge, eraser) can be double tapped to access Procreate’s brush library, with each brush being double tapped to alter a range of properties that you would from the aforementioned desktop programs. In addition, simple sliders on your left or right (you can choose which) let you set the tool’s size and opacity. After a few hours work, I realised that this nested menu system and three tool approach allowed me to perform most of my actions for roughing out or detailing a particular part of a painting using just one tap to switch between tools. Procreate keeps things simple, focussing on digital painting, so many of the filters and special fx functions that Photoshop users are used to are not present. In my opinion, this is no great loss, especially when the few functions that are present (including the new perspective blur and upcoming perspective grid functions) are all of use to the digital painter. Keeping fancy filters to a minimum and limiting canvas size and layers means that Procreate is completely free from lag on the iPad Air 1 I am currently using, making the painting experience smooth and responsive. Procreate’s most unusual feature is an automatic time lapse record of your painting process. It would be easy to dismiss this as a gimmick, as it really doesn’t add anything to your ability to create artwork, however, this would be rather unfair. The feature is tucked away behind a menu and doesn’t create any notable drain on system resources. Plus, with artists and illustrators increasingly needing to create social media and tutorial content, the ability to generate video footage of the painting process can be of great use. and Wacom Creative Stylus . The recent addition of pressure curves for these devices is a welcome one, although the lack of palm support for the Wacom device is slightly irritating. When considering any new piece of software or hardware in my practice, it’s ability to fit into my workflow is very important. This is where Procreate begins to fall short, although the blame can’t entirely rest with Savage Entertainment as the short comings tend to rest with Apple’s architecture. As well as it own proprietary format, Procreate allows you to export your files as layered .psd or flat .jpg and .png. The lack of of a layered .tif option is a disappointment but not a serious problem. The real issue comes when trying to move a file from Procreate to the desktop system in my studio. While I have a NAS drive set up set up to facilitate this sort of thing, the only way to bring a painting from Procreate to Painter or vice versa is to export and import via a cloud system such as Google Drive. While this has allowed Procreate to become a useful sketching device and a way to generate roughs outside of the studio, it does fall short of the potential to move artwork from desktop to tablet and back with ease. Mac users may have an easier time of course. 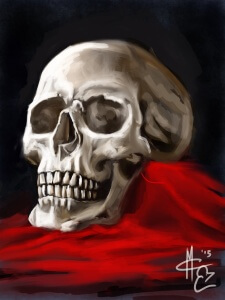 Procreate is by far the best digital painting application for the iPad, simple enough for beginners but with sufficient customisation to allow professional users to achieve a high quality of work. 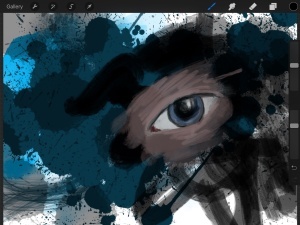 For an app price-point, Procreate comes close to rivalling the quality of its desktop contemporaries. If you already have the hardware and are looking for a digital sketch pad then I strongly recommend you give Procreate a try. However, Procreate is limited by its nature as a tablet application and if you are looking to expand your practice to a tablet solution you may want to look at investing in a Surface Pro or similar device to provide continuity between devices and tighter stylus control.